It's beginning to look a lot like Christmas!! And I'm back again with Team Xyron to bring everyone a little bit of holiday cheer with today's project! 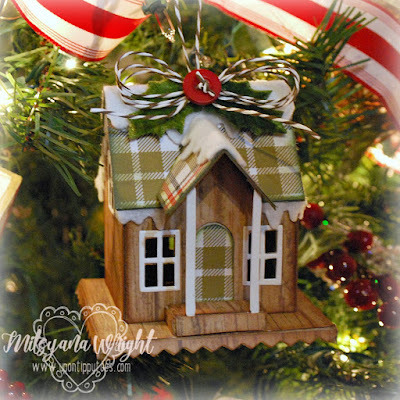 Today I will show you how I made this adorable Winter Cottage Christmas Ornament. I started by cutting a 12"x12" woodgrain patterned paper ,from the Happy Day Stack, in half to measure 6"x 12". 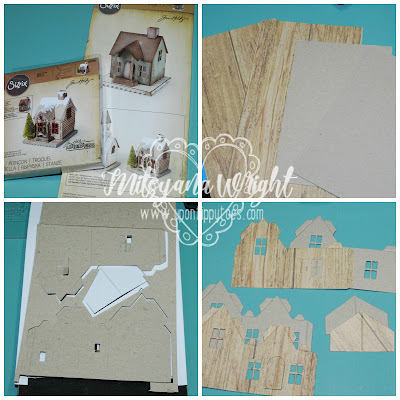 Then, I cut my chipboard down to the same measurements. 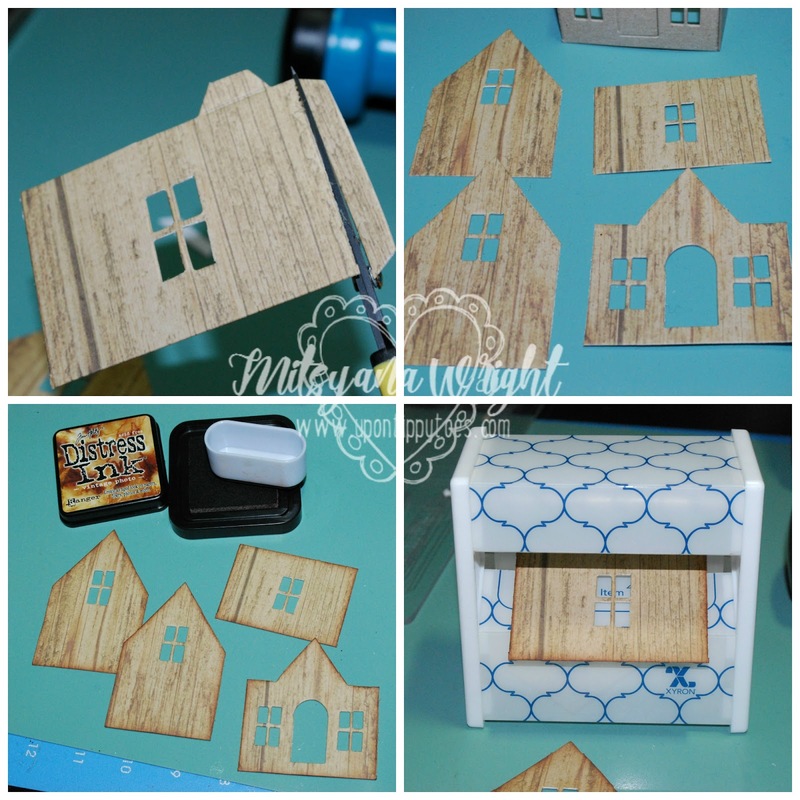 Using the Tim Holtz Village Dwelling Die, I layered the patterned paper (face down) and the chipboard onto the die. I sandwiched them between two clear cutting plates and used ran my it through my Big Shot machine. I folded the creases on just the Chipboard pieces. 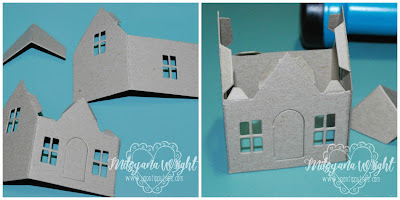 I bent the walls into place and used clear adhesive on the small flaps to connect the pieces together to form a house's walls. Next, I trimmed off the flaps/ tabs of the patterned pieces and cut along the crease lines to separate the segmented pieces. 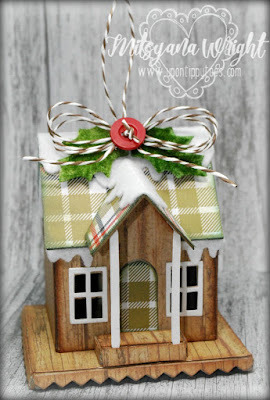 I used a sweeper tool and Tim Holtz' Vintage Photo Distress ink to shade the edges. Once ink was dry, I ran the pieces through my 3" XYron Sticker Maker. 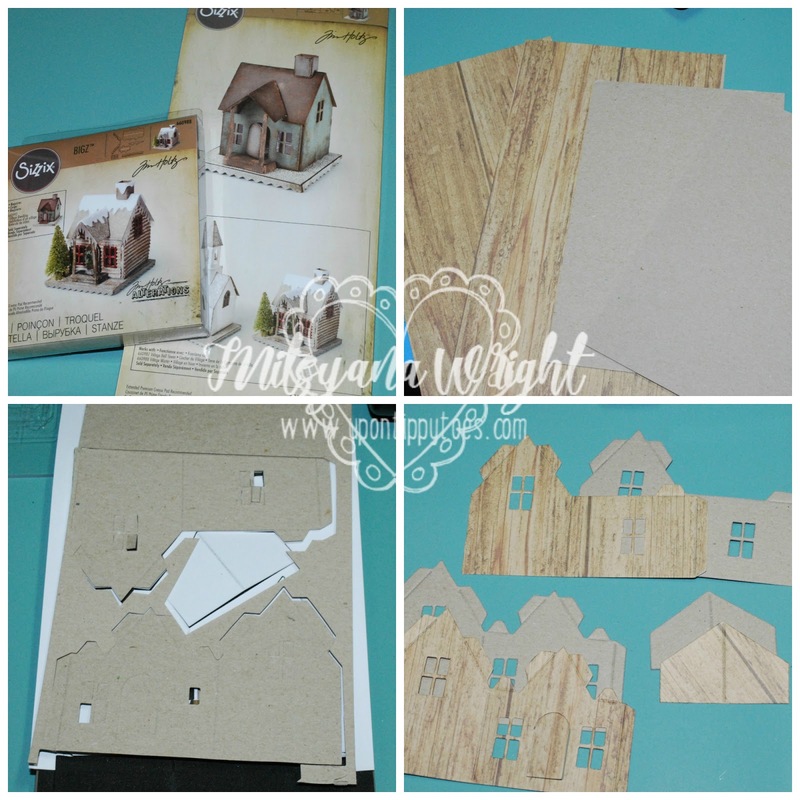 Then peeled and applied to the chipboard house. 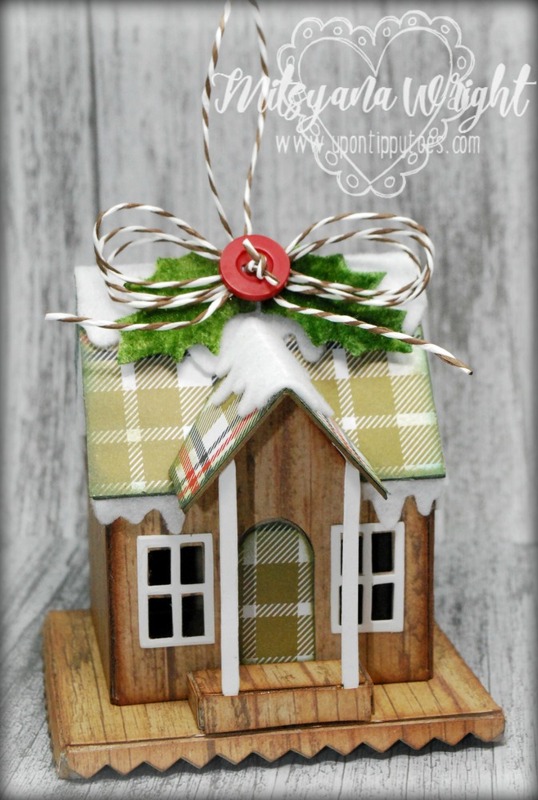 I also Die cut the roof and porch pieces out of chipboard but opted to use this gorgeous green plaid from the Christmas Plaid stack for the rooftop and door. 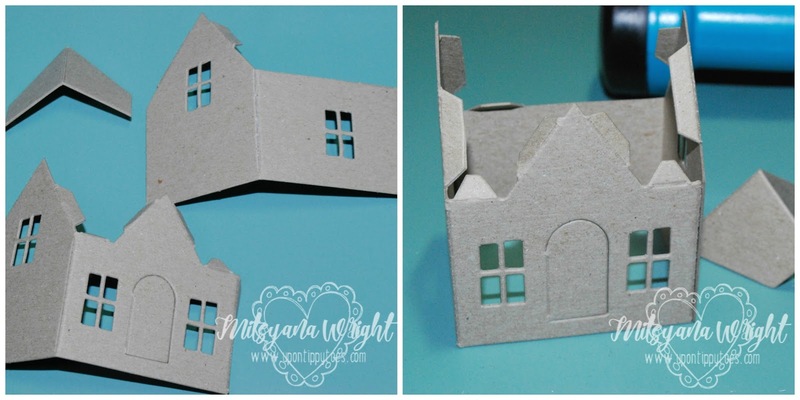 I die-cut the windows from just plain white cardstock. 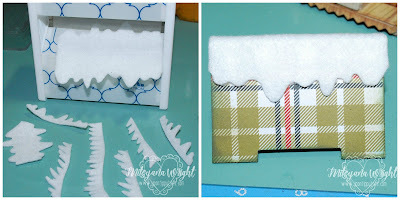 Using the Tim Holtz Village Winter die I die-cut all the snow and ice from white felt. Then ran those through my Xyron Sticker Maker as well. Helpful tip: Before peeling the protective film off the felt... give it a heavy handed press/ rubdown. Then, I attached the snow onto the rooftop. Before attaching the roof top to the cottage, I used my piercing tool to create a small hole atop the roofline. Then, I threaded some brown and white Paper String through the hole and double knotted it. Then with more clear liquid adhesive, I attached the roof as well as the porch. I added a few green velvet holly leaves and a button topped bow and glued them to the top of my cottage. 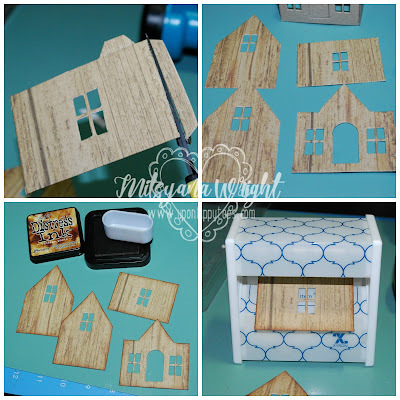 I diecut the windows and and porch pillars from white cardstock then used more clear liquid adhesive to attach them to little dwelling. Below are different angles of the Winter Cottage. And here is a close up of it hanging in my tree!! These are not overly big and not teeny tiny either. But because we used light weighted materials it is quite a substantial ornament. This turned out so CUUUUTTEE!! I LOVE IT!! Hope you all loved today's project as much as I did!! Love it, love it, love it! AND you used PLAID! Just loved the look and appreciated the step by step. Very helpful for me. Thanks for sharing.